Police Emergencies European emergency number: Phone 112. This general number is used in all countries of the European Union to contact the emergency services: police, fire brigade or medical assistance. The number operates 24 hours a day, 7 days a week. 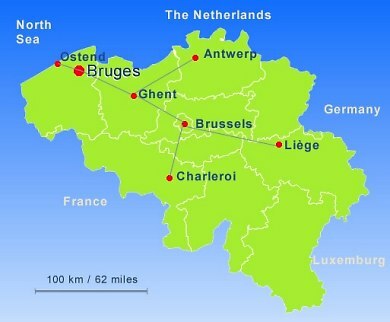 Where is Bruges on the map? How toe get here by car or camper van ? Parking in the inner city. (Canal Island) at the Bargeweg offers excellent hard standing for 59 campers all year round. Once your camper is parked, you are just a fiveminute walk from the city centre (via the Beguinage). The parking area is open for new arrivals until 10.00 p.m. It is not possible to make prior reservations. Apart from these camper van parking areas, there is also a parking lane along the ring road R30, between the city gates Gentpoort and Kruispoort, near the Speelpleinlaan. On this parking lane, all types of vehicles, including camper vans, may be parked. In order to optimise urban access and quality of life for residents and visitors alike, no coaches are permitted in Bruges city centre (including 't Zand and the Vrijdagmarkt). The only safe and obliged pick-up/drop-off area for groups is the coach parking at Bargeplein (Kanaaleiland) which is exclusively reserved for coaches. This parking lies within easy walking distance from the historic city centre and is a popular starting point for a guided visit. All amenities necessary (such as toilets, cash dispenser) are available and in case of bad weather there is a canopy for shelter. “De Lijn” offers a regular city bus service. Only coaches dropping off/collecting passengers with luggage at/from their hotel get exceptional access to the inner city. Excursions or contemporary transfers by coach from the hotel are not allowed and are only possible with pick-up/drop-off point at Bargeplein (Kanaaleiland). The police control the strict compliance of these arrangements! How to get her by train? How to get here by airplane? Brussels is an important hub in international air traffic. Bruges is within easy reach (approximately 1 hour) by car, our train-connection. Our airport warmly welcomes its passengers. From 1 January 2015, the City of Bruges will be introducing a tourism tax of EUR 2 per person per night. This tax relates to all tourist accommodation (hotels, guest houses, hostels,...) with the exception of holiday homes that are subject to a flat-rate tax. Children under 18 are exempt from the tax. If the accommodation is subject to VAT and opts to pass on the tourism tax to the customer as a separate expense, which is internationally customary, the tax will be increased with VAT (currently 6%). In Belgium there is a general ban on smoking in cafés, restaurants, the public areas in hotels (lobby, bar, corridors, etc.) and in all public buildings (train stations, airports, etc.). Those unable to kick the habit will usually find an ashtray just outside (often under shelter). There are cash points in the most important shopping streets, on the Markt (Market Square),’t Zand, Simon Stevinplein, Stationsplein (Railway station Square and on the Kanaaleiland (Canal Island, in the Bargeweg). You can withdraw cash from these machines at any time of the day or night, using your Visa, Eurocard or Mastercard. Belgium has quite a lot of public holidays. On these holidays most companies, shops, offices and public services are closed. And how about the weather? Follow the actual weather in Bruges on Weathercam Brugge . Weathercam Brugge provides a weather webcam, a weatherstation with actual data and weather forecasts for the region. Location of the Tourist Information Office "In en Uit"